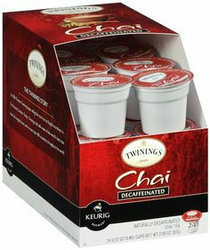 Twinings Chai Tea K-Cups (24 Count). Twinings blends to perfection the finest black teas with the sweet and savoury spice flavours of cinnamon, cardamom, cloves and ginger to give you a line of great-tasting Chai teas with a bold, spicy taste and rich, vibrant aroma. Each box contains 24 single serve K Cups. Did you know? Chai is a term for spiced tea from India (most famous being "masala chai"). In the United States, many people refer to Indian tea as Chai tea.